A friend recently asked my professional opinion about what she could do to help remedy with some symptoms. She’s been overwhelmed by constant nausea and an old wrist injury since her marriage fell apart. As usual I said, “Ask what your body needs.” That is, I suggested she talk to her wrist and stomach – listen to what they have to say. Of course! Here I am, constantly spouting off about something that’s obvious to me, and to someone who’s already worked with me. That concept may mean nothing to you, or you might have a notion that’s only somewhat related to what I’m talking about. Let’s clear that up right now. How do you listen to know what your body needs? Your body speaks to you on a daily basis. When you get hungry or tired or have a pain, your body sends you a series of signals to indicate that something needs your attention. Ideally, you eat when you’re hungry and sleep when you’re tired, and step away from the computer to rest your wrist when it hurts: that’s you listening to your body. If you’re well tuned-in to your body and actually heed its signals, it doesn’t need to speak very loudly. Sometimes, though, you ignore those signals, or you’re not in touch enough to actually hear them. In which case, the signals get louder: you feel faint and irritable from low blood sugar, your mind is foggy from lack of sleep, or your wrist is so badly inflamed, you can’t work for 3 days. More specifically, you need to listen to your body when sorting out how best to address a certain ailment and to understand if certain remedies are working. Let’s say we’re talking about my friend’s nausea. I would ask her to take a few days to notice if there’s a time of day when it’s worse, if certain foods or activities aggravate it or make it better. Then, once I’ve made certain suggestions about her eating habits, maybe some herbs, she’ll continue to check in to notice any improvement. What your body needs reveals the needs of your soul. Don’t worry, there’s a how-to audio for this part at the end. The other concept I throw around a lot is based on that Teilhard de Chardin quote about us being souls having a human experience. The idea that your body is a container which allows your soul to move on the earth. Your body is how you interact in this existence. So it stands to reason that if the soul wants to send you a message, it’s going to do so through medium of your body. The sensations you feel in your body are your soul speaking to you in a language you can understand. In that regard, listening to your body involves so much more than noticing your symptoms after certain foods. Listening to your body is part of a healing conversation. When you tune in and hear what your soul is saying to you via the body, you are engaging in a conversation with your self. You are deepening the relationship to your self – in the same way that conversations with the women in your life have turned them from acquaintances into friends into your support system. Conversations aren’t one-sided. They are a back and forth exchange – speaking as well as listening, asking as well as answering; giving and receiving. When you speak your concerns aloud, whether to yourself or a friend, you draw them out of the shadow of fear and into the light for healing & release. When you share the experience of what you’re feeling in your body with a practitioner, give her a more complete picture of why your body is reacting the way it does, and how to best approach its healing. What I teach women is based on a technique known as Focusing – developed by psychologist Eugene Gendlin. Some people refer to it as hearing your inner voice or your soul voice or your higher self. Basically, you’re talking to YOU. Listening to your body – having a conversation to better understand how it works, how you work – what lights you up and what drags you down – is an essential part of the healing journey. Put your info in the grey box to access the audio guide which walks you through the steps. How do I listen to my body? Know anyone else who wants to (re)connect with her body? Share this post using any (or all!) of the pretty green buttons. 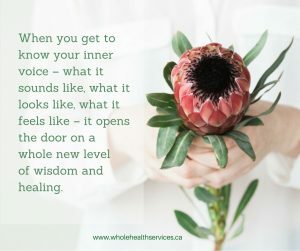 This entry was posted in Creating Health from the Inside Out and tagged connection, healing conversation, healthy relationships, listen to your body, needs by Cathy Cochrane. Bookmark the permalink.